At the Wilf Lower School Campus, we are continually striving to deliver creative approaches to enhance our program. This past summer, we were fortunate to receive a grant from Golda Och Academy’s Fund for Faculty Innovation and Excellence which enabled us to institute a number of exciting initiatives. From new avenues of communication, to an original model of pedagogy in our Judaic Studies curriculum, to a sensory room which helps students to calm themselves and focus, these changes have already been impactful within our Lower School community. Parent Communication - Many parents, at one time or another, wish they could be a fly on the wall in their child’s classroom. To provide parents with a more comprehensive understanding of the educational experience, we are adjusting our approach to effective parent communication with the increased use of student and teacher video blogs (vlogs), classroom videos of projects and events, a new model for Open School night, and dynamic, picture-filled teacher webpages. Through a variety of new modes and techniques, the magic in our classrooms can be seen, felt and heard. Judaic Studies Pilot Program - With the commitment to continuously be aware of the changing needs of our students, we have launched a new Judaic Studies program for current 3rd and 4th graders. Our JS 3-4 Pilot provides a differentiated approach to Hebrew language instruction, with Judaic Studies taught primarily in English. This type of classroom experience enables a broader range of learners, particularly those with language-based learning challenges, to engage with the material in meaningful ways. 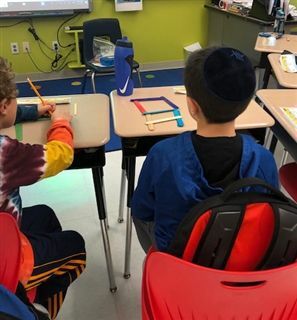 Using a variety of modalities, from art and writing, to drama and educational games, the students find increased success and enjoyment in the Judaic Studies portion of their day. Their study of Torah, Jewish holidays, Israel and Hebrew language is all reinforced in an atmosphere of creativity and joy. Sensory Room - Weighted balls to bounce, “crash pads” to jump into and beans to sort through are all being used in our sensory room. In consultation with a behaviorist and an occupational therapist, we have designed a space with equipment for both sensory input and output, depending on a student’s particular need. A “sensory diet” is provided on an individual basis, whereby students are given specific exercises to perform within an allotted amount of time. Teachers have received professional development to help identify students for whom this space will be beneficial, as well as to utilize the room effectively. The sensory exercises help students to be better prepared for learning and for interacting with others. We believe these innovative initiatives will impact our school culture, enrich student learning and help to re-envision the parent experience for our families. The Fund for Faculty Innovation and Excellence has enabled us to move forward with exciting new plans for GOA that we hope will last well into the future.